From Touriga Nacional (70%) and Bical (30%) grapes, created in the vineyard with the same name, from the first harvest of their vines. The wine was fermented in oak casks of second year, for a month. After the preparation of the base wine for sparkling, we proceeded to the bottling, to the production of gas in the bottle by fermentation of the added expedition liquor. 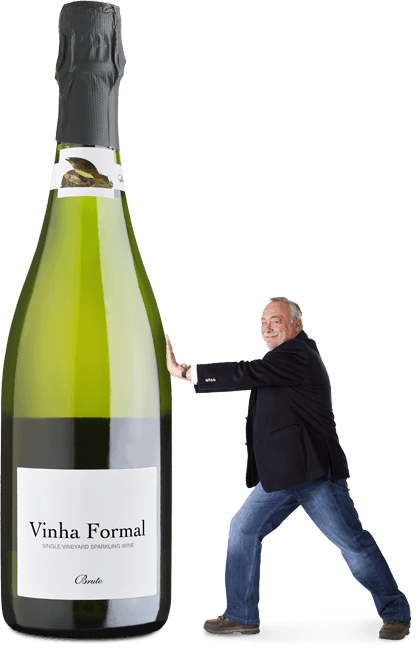 It was on the lees in the bottle during the legal period for sparkling Bairrada designation of origin, for 9 months. 500 bottles will be kept on the lees to be sold after two and three years in order to make all the aromas of aging from these two noble varieties. To be dished up with roasted meats, sweet desserts and the usual oily fish and seafood.